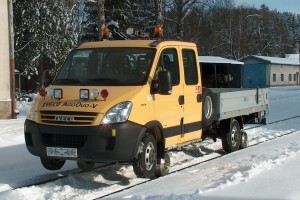 Road-Rail vehicle IVECO DAILY AGO DUO is designed for ride and work on road as well as for ride and work on state, regional, and plant railway tracks. Vehicle drive on rails is of a friction rubber-steel type, where drive is achieved by friction of rear tyres on the rails. Front road axle locking mechanism maintains the required height of the front axle tyres above the rail head during ride on rails. 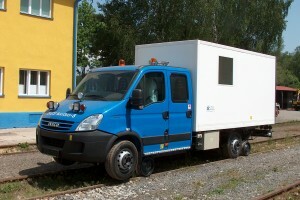 Vehicle is an ideal emergency machinery with capability of carrying 1+6 operators! Maintaining overhang angles as designed by manufacturer proves a very good convenience during ride on road. 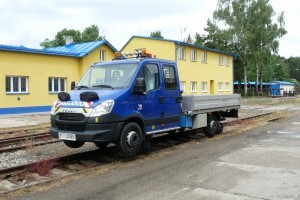 Vehicle can be equipped with platform body with tiltable side plates, container or other superstructures. Constant speed forwards and backwards during ride on rails is achieved by reversible gearbox for constant speed drive forwards and reverse. Electronic display unit is used for monitoring speed, operation and failure conditions. Both rail gears are controlled hydraulically. Front road axle tyres are raised above the rail head during ride on rails. All movements are hydraulic and controlled electrically from the driver’s cab. For safety ride, vehicle is equipped with CCTV camera system and full-colour LCD display.